I came to the conference with precious little knowledge about G-cloud, except from a few pages that I had read (e.g. John Suffolk and Cloudbook) but just an impression that perhaps G-cloud by definition should/could be totally open (open source, open data, open data structure, open ….). Well working in the public sector I have become increasingly aware that our ability to be agile is frequently hampered by the software systems that we use. Specifically, most of these systems cause problems due to vendor lock-in. The main impacts of vendor lock-in is that we are dependant on the vendors for development (e.g. we have been waiting for 16 months for a working connector between our casework system and ePlanning) but also it is extremely difficult to switch between vendors . The other issue is that in Scotland the legislation etc. is generally different and we often end up with software that is ‘Scottishised’ i.e. usually does not quite meet our needs. So our current situation is that our systems sit within our network, difficult to connect to the outside world, difficult to create additional functionality …. you get the picture. My dream … our future systems would probably be outside our network and would be modular, so that all users use a core business logic but can ‘pick and mix’ the modules to bolt on to the core. The data would also meet agreed Open Data Standards/Structure (see PODS), which would enable us to easily switch vendors and if necessary develop functionality in-house. Also other user groups that interact with us (e.g. Community Councils) could also more easily develop functionality linked to our systems. So when I heard about G-cloud I wondered if it might be my ‘dream’ solution. Could this deliver what I want (an end to vendor lock-in) and help develop shared services? Procurement policies in relation to open source. My take when I went to the conference was that we should push the UK government to ensure that the G-cloud can meet our Scottish needs (i.e. componentised and open so that it be developed). However, my impression was that perhaps there is not much appetite for taking on the UK government (it’s probably just me). So perhaps what we could do is start by getting a few Scottish public sector agencies together and set up our own ‘cloud’ for testing purposes. This might then provide an opportunity for developing our own Government Open Systems (GOSCON might be a starting point)? Who knows, our existing vendors might then be interested in developing more open solutions? I see Holyrood has organised a conference on ‘Cloud Computing for the Public Sector’: http://cloudcomputing.holyrood.com/ Sounds interesting, but it’s a tad more expensive than ScotGovCamp 🙂 Anyone intend going along? In the current financial climate you would think that more events would be run like ScotGovCamp plus I wonder if the Holyrood conference will have the same buzz/energy that we experienced! I doubt it Nick. They always get the big names, but I don’t think Holyrood Conferences provide good value for money. And generally have very low levels of interactivity – although they are getting a bit better at that. This is Chal from Holyrood – I am developing the cloud conference linked. Its good to see some Scottish specific discussion around cloud issues! We have endeavoured to enable discussion through a half day worth of Q&A format breakout sessions – looking at what the big barriers to cloud adoption are in Scotland from a user perspective. I can be certain that you wont get the level of interactivity you desire, as in this instance the focus is on educating and addressing concerns, while raising the profile of cloud computing and what it can do for Scotland. 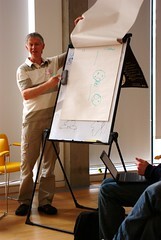 Would be interested in hearing more about your plans for providing more interactivity at events- do you blog? We will be aiming to get something more substantial and permanent into place in the near future. I am keen in the first instance to get some audience participation in the creation of an event including mini online consultations, polls and creative use of social media. I would hope to allow delegates to direct the conversation in advance and then perhaps have some flexible sessions built into the usual format to start with.